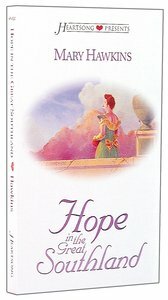 About "Hope in the Great Southland (Heartsong Series)"
With well over 800,000 books in print, Mary Hawkins has been a prominent figure in the Christian fiction world. Mary's dream of becoming a published novelist became true in 1993 with the release of her first book. Since then 18 titles have sold world-wide with Australia, a collection of contemporary Christian romance novels becoming a best-seller. Mary and her husband Ray, also now a published author of devotional books, have been in pastoral ministries in New South Wales, Queensland and England. They now live in Australia's island state, Tasmania.